Mix your food like a pro without any skill or practice necessary. This handy little kitchen miracle will allow you to whip, mix and blend ten times faster than with a traditional whisk. Simply press down on the handle and the whisk end spins to mix your food. A continuous up and down motion will blend anything quickly and efficiently, and it will require way less time and effort. Made from high quality stainless steel, the Super Whisk is both easy-to-use and durable. Instead of spinning a regular tool around and around, you can simply dip this one into whatever you are mixing, and then pump the handle to whip it to perfection. It is ideal for mixing drinks, preparing pancakes, making waffles, fluffing omelettes, blending whipped cream for a dessert, and so much more. The easy action of the handle does not require super strength to work, and it will glide effortlessly for just about anyone. Save yourself time and energy as you prepare better looking food. Order Yours Today! Uses whipping, stirring, mixing, etc. - Push down to rotate the whisk for ten times the mixing in the same amount of time. Whip food like a pro. Rotating End Yes - Press down the handle to spin the whisk. A continuous up and down motion will efficiently mix any food. Stainless Steel Super Whisk - A true kitchen miracle. Whip up any food in way less time with this hand powered mixer and whisk. 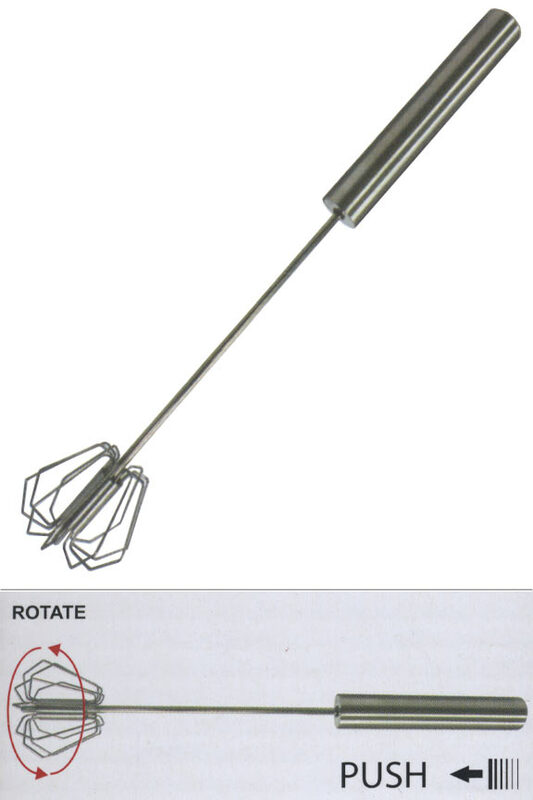 Simply move the handle up and down to twist the whisk and mix your food. Look like a pro. No skill necessary! Order Yours Today. This is all stainless steel, very sturdy. Easy to clean (hey.. egg is egg!) Better on my shoulder and wrist than hand whisking or getting the mixer out. I use it to froth my matcha green tea. Honestly, I use this every day. This super whisk is great. It is sturdily built and whips cream up quickly. I bought two, one for myself and the other for my daughter in culinary school. I've yet to send my daughter's but am sure she will love it. I have had five hand and wrist surgeries that have reduced my strength and dexterity as well as causing severe arthritis. The super whist relieves so much wrist pressure. This is one of the best kitchen utensils I have ever bought! Every good cook should have a wiskit! this is the best tool ever for making omelets, or scrambled eggs. fast mixing and very fast easy cleaning. this was my second purchase for this, I liked it so much I"m giving this one as a gift. We use this all the time, whips up eggs perfectly. A must have for the kitchen. Not sure how we lived without it. I would recommend this super whisk. It is easy to use /easy clean up. Handy tool to have in the kitchen. I have 3 of these, why do they leak rusty water? Best guess... Because you didn't get them from us. Products out there that look the same, are not always the same quality, no matter how much you spend on them. If you had bought from us, they would be the quality originally expected, and if you had a problem, the replacement would already be in the mail. Sorry to hear of your trouble though. Please contact us by phone or email, and we would be happy to offer a discount on replacements if you are interested. almond milk.Why no instructions or receips? Yes. We will have recipes coming soon. This is a new product, but it provides incredible whipping power, so you could certainly use it for almond milk. Has anyone tried this on instant mashed potatoes? I work in a kitchen where we make up to 8 gallons of mashed potatoes. Will this work on a thicker food not just liquids? You can use it for any number of food prep jobs, not just mixing liquids. It should help save time an effort when mixing mashed potatoes too. An Easy-To-Use, 5-In-1 Sushi Mold Kit. Free Knife Included! A Stainless Steel Can Colander With A Long Handle. Compatible With Various Can Sizes.